Another book about Porsche but this one is written by Jürgen Barth, Porsche employee and racing driver. The three-volume set has been available in German for many years but only now has it been translated into English. The main thrust of the book is coverage of every Porsche made, from 1950 onwards, completed with detailed information and plenty of colour and mono photographs. 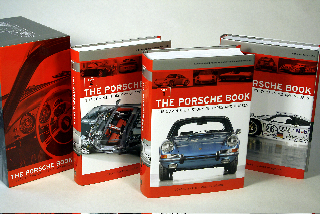 Volume one covers the 356 and 911, volume two the mid- and front-engined cars, while the third volume is devoted to Porsche’s racecars. In all, there are over 1500 pages. It’s an expensive book at £199.00 and much of the information is already available elsewhere. However, if you’ll looking for a complete one-stop shop for Porsche, then it’s well worth the investment.